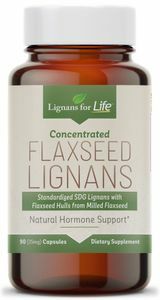 Lignans for Life Concentrated Flaxseed lignans (SDG) Lignans from Flaxseed Hulls For People or Dogs Cold Milled Processed, Non-GMO, Gluten Free. Vegetarian capsules. 90 count bottle. 90 servings. Each capsule contains flaxseed hulls and standardized SDG lignans from flaxseed hulls to provide a consistent 35 mg of SDG lignans. The flax hull powder is ground up and combined with a very highly concentrated SDG lignan extract from flaxseed. Each capsule contains 230 mg of flaxseed hulls and 70 mg of 40% standardized SDG extract for a total of 35 mg of SDG Lignans. Lignans have hormone balancing properties. Lignans are phyto-estrogens (plant estrogens) that mimic normally occurring (endogenous) estrogen. Lignans balance estrogen levels to help support breast health. They bind to estrogen receptors, but with less biological effect. Lignans may also block the conversion of testosterone into DHT. This helps support prostate health. The high amount of fiber in flaxseed lignans also helps support colon health. Lignans have indicated a variety of other benefits, such as heart, cholesterol, and hair health. What's the difference between this product and regular flaxseed? Regular flaxseed contains the embryo of the seed, which is where the oil comes from. Our product contains only the hull of the flaxseed, where all the benefits reside, and has a higher amount of lignan than regular flaxseed. For People: Take 1 mg of lignan for each pound of body weight. For People: Take 3-6 capsules per day with a large glass of water. Capsules can be taken all at once or spread throughout the day. The capsules can also be separated by pulling them apart. The powder from the capsules may be sprinkled onto food or smoothies or baked into food. For Dogs: Capsules can be pulled apart and the powder can be sprinkled onto dog food or mixed with peanut butter. The full capsule can also be hidden in peanut butter, a piece of cheese or meat, a pill pocket, etc.